Joseph A. Esposito is a historian, writer, educator who served in three presidential administrations. 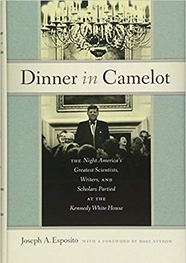 He is the author of Dinner in Camelot: The Night America’s Greatest Scientists, Writers, and Scholars Partied at the Kennedy White House (2018). This caricature is by George Wachsteter (1911-2004) and ran in the April 14, 1938 edition of the New York Times. Drawing courtesy of the author. Franklin D. Roosevelt, who was born one hundred thirty-seven years ago today, is not among the four giants on Mount Rushmore. But that’s only because he hadn’t been president yet when Gutzon Borglum began it in 1927. Unquestionably, Roosevelt is the most consequential American president since Abraham Lincoln. The ambitious cousin of Theodore Roosevelt led the nation through the greatest trails since the Civil War: the Great Depression and World War II. FDR was a complex—even devious man—and yet his presidency was one of extraordinary accomplishment. Roosevelt embodied many characteristics of leadership which should expect of a president. One of them was a sense of empathy and appreciation for people less fortunate. An important influence on him, of course, was Eleanor Roosevelt. Also significant was his own health challenges with his public and private challenges dealing with the effects of polio. He showed his personal commitment to helping others similarly afflicted at Warm Springs, Georgia, facility. Of course, FDR was a premier communicator. His first inaugural address and his Fireside Chats helped rally the nation during the depths of the Great Depression, something that his predecessor was unable to do. The nation had confidence in him when it sent its soldiers and sailors to fight in Europe and the Pacific in the 1940s. But what is so extraordinary about Roosevelt’s leadership is his embrace of experimentation, something which he identified even before he became president, and he did it in Atlanta. Oglethorpe University’s president, Thornwell Jacobs, had invited the New York governor and part-time Georgia resident to speak in 1931, but FDR postponed the visit to May 22, 1932, when he addressed the graduating class at the Fox Theatre. He used the platform to outline his approach to the crisis gripping the nation. Following the stagnant response by Herbert Hoover, Roosevelt presented a general, but aggressive approach. Crucial to his address that Sunday night was a call for “bold persistent experimentation.” Implicit was a call for greater engagement at the national level. He offered hope by suggesting that central, coordinated planning to address the problem. The soon-to-be nominated presidential candidate laid out the basis for the New Deal and provided the groundwork for citizens looking to its chief executive as a focal point of American governance. In the following years, Roosevelt tried one new program after another, seeking to bolster the economy, provide a safety net to the most vulnerable, and to create ways to employ people while enhancing the nation. Among the greatest achievements of the latter were the Civilian Conservation Corps, the Works Project Administration, and the Federal Writers Project. The Oglethorpe speech to a small graduating class in downtown Atlanta not only presaged the national response to a great challenge, it also suggested the beginnings of the modern presidency. 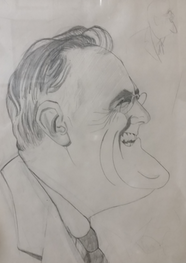 Roosevelt would be elected president four times—a unique achievement—but also was a problem-solving leader, not hamstrung by ideology but liberated by effective pragmatism. That’s a quality that should be compelling in the twenty-first century as we confront what appear to be a variety of intractable problems.